Now that we’ve come through another trip through the newborn phase, here’s the question: Is it easier to go from 1 to 2 kids than it is to go from 0 to 1? And the answer? For me, yes – times a million. It’s also easier to have a newborn and a 2-year-old than it is to be 9 months pregnant with a 2-year-old. I heard that when I was pregnant and didn’t believe it, but it’s true – or it was for me. EASIER, mind you, not EASY. 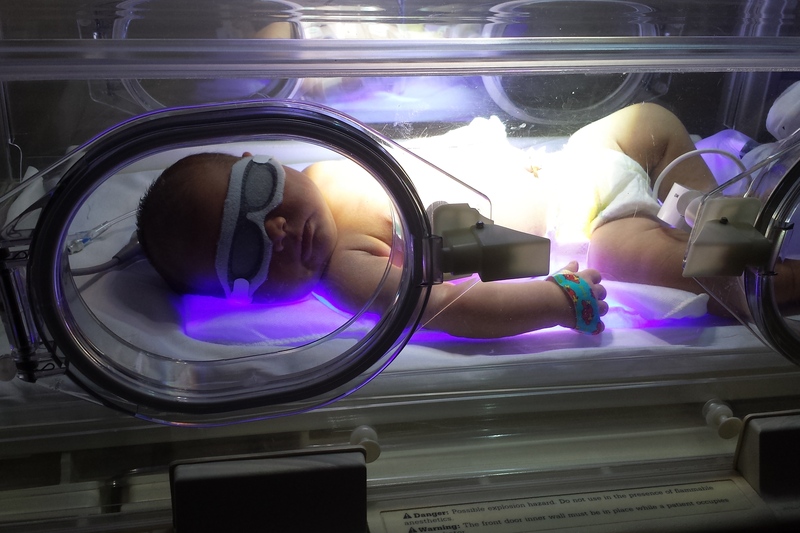 We got off to a bit of a rough start with Leah due to her jaundice. I had hoped that we’d be able to leave the hospital early on our second day, but Leah needed repeat tests on her bilirubin levels so it was the evening before we got out of there. Just 24 hours after we got home from the hospital we were headed back there so that Leah could go under the bili lights. The whole thing was very traumatic for all of us. Leah needed several blood draws and an IV, all of which proved very difficult for a lab tech and 3 nurses. When she was finally all situated under the bili lights, it was the middle of the night and there was only room for one parent to stay so Bill went home and I had to stay alone with Leah. The hospital was the absolute last place I wanted to be, especially after spending the entire previous day waiting to be discharged after the birth. Thankfully, her bilirubin level came down and we went home for good the following evening. Once we were home (again), we finally started to settle in. Bill and I took a “divide and conquer” approach with the kids. 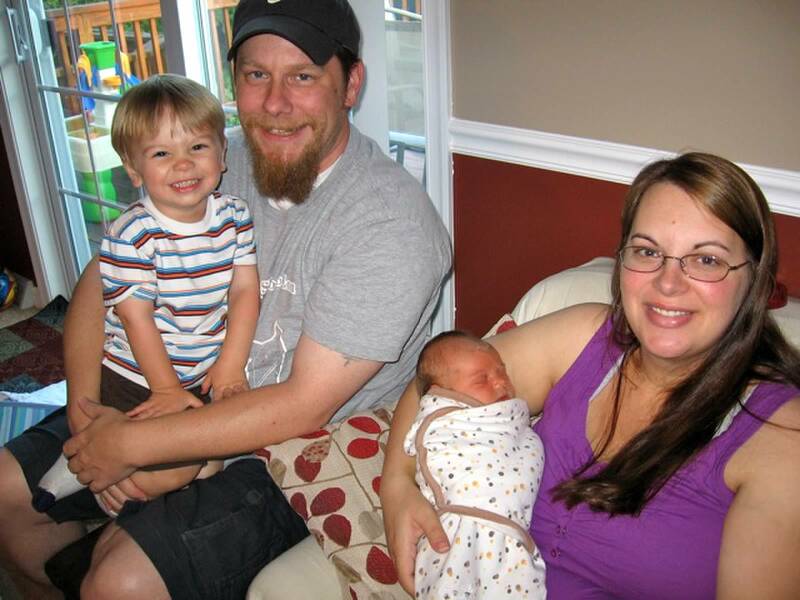 Bill was on Caelan duty – daycare pick up and drop off, diapers, meals, baths, everything. I was on Leah duty – nursing. This plan worked well for us but I barely saw Caelan and I missed him. He’s always been more attached to Bill than to me and that became even more pronounced now that he and Bill were spending much more time together. On the other hand, Bill barely spent any time with Leah since he was always busy with Caelan. Things started to even out a little bit when Bill went back to work after 3 weeks and we started to get into our (new) normal routine. But those first 3 weeks (taking care of Leah) were easy for me, and it’s because of Bill. I took care of Leah but Bill did EVERYTHING else – cooking, cleaning, laundry, Caelan-care, etc etc. I’ve taken on that role myself (sole responsibility for child and home) on a couple of rare occasions over the past 2 years when Bill went out of town for work and it is no easy task. I’m super lucky that Bill is such a great husband and dad. Super, super lucky. Leah slept in our room in a mini Pack N Play for the first 6 weeks and then we moved her to the crib in her room. I felt the exact same way when we moved Caelan to the crib at 5 weeks which was a little hesitant, but hopeful that it would be a good move. And in both cases, it was. Leah’s first night in the crib was rocky, but I honestly don’t think it had anything to do with the crib. Her sleep was still really irregular then. But she settled into her room and started sleeping 5-7 hours a night pretty regularly around 8 weeks. We had planned to keep Caelan in daycare full time, but it turned out that his daycare was closed for several days in September so I ended up having both kids home with me for those days. Some days were awesome and I felt like Super Mom, but some days reminded me exactly why I’m not a SAHM…and why I’m so glad I have an iPad. Caelan and I both thrive when he’s in daycare and I know Leah will love it too. It’s definitely a good choice for us. But being at home with both of them for a few days was good for me too. It forced me to relax and give Caelan a little more freedom because I couldn’t give him my undivided attention anymore. It actually felt like a relief to let some things go. Letting him happily empty his entire toy box was so much easier than scolding him for taking too many things out at a time. He made a massive mess, but… who cares? It was a small price to pay for my sanity. And we cleaned it up at the end of the day …sometimes. I went back to work after 10 weeks which I think was just the right amount of time for me. By then, I was starting to feel like I was getting sucked into some kind of black hole of laziness at home so it was time to shake it up and send Leah to daycare and send me back to work (and back to earning a paycheck!). The transition has been smooth so far. We’re still working out Leah’s evening routine because she isn’t going down for the night at a consistent time yet, but we’ll get there. I breastfed Leah for 11 weeks. This time around, it was much less overwhelming and I felt more comfortable with it. 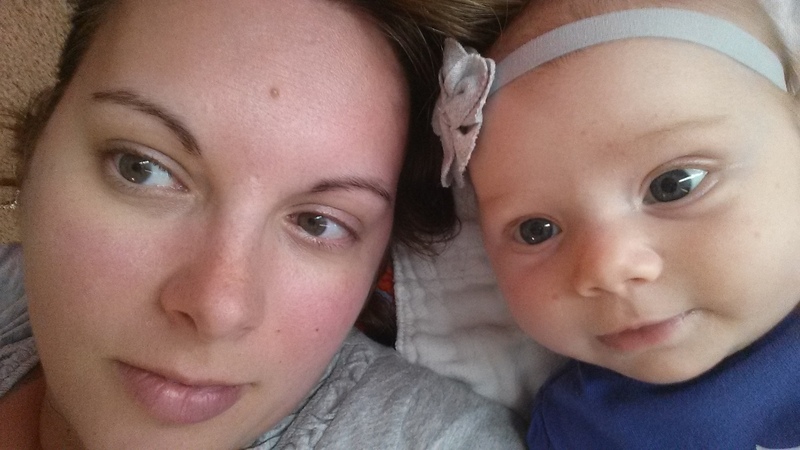 My goal was to make it to the end of my maternity leave and to attempt to continue nursing morning and night after I went back to work, and I did meet that goal. We introduced bottles and formula from day 1 so she wasn’t exclusively breastfed, but I did nurse her for the 10 weeks I was on maternity leave and for the first week I was back at work. She had a little bit more trouble switching back and forth than Caelan did (she was much better at nursing) but she handled it. 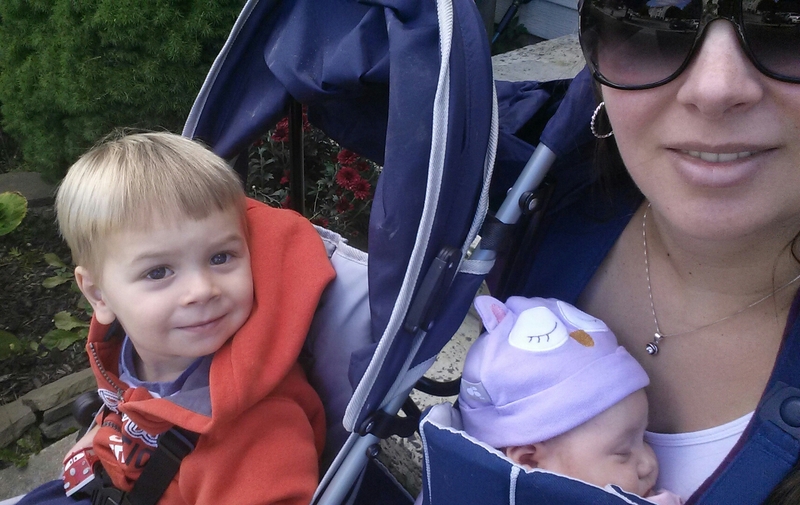 As I was when I was breastfeeding Caelan, I was very conflicted on how long to continue. I thought it would be easy to just nurse her morning and night instead of giving bottles for those feedings, but I didn’t take cluster feeding into account. Caelan never cluster fed, but Leah did most evenings. She also showed signs of comfort nursing and sometimes that seemed to be the thing that would ultimately knock her out for the night and I felt really wary about getting into that habit (even though it was still a little early to be worrying about habits). The inconsistency and unpredictability of nursing got to be really frustrating for me. Finally one night I just didn’t nurse. I thought maybe I would the next morning, but then I didn’t…and that was it. I still feel conflicted, but what’s done is done and I don’t regret my decision. After I stopped nursing, I broke into my small freezer stash and I’ve been giving Leah a bottle of thawed milk once a day since then. She had the last one this morning so she’ll be 100% on formula from here on out. In the beginning, I felt kind of desperate for Leah to get old enough to be a little responsive. 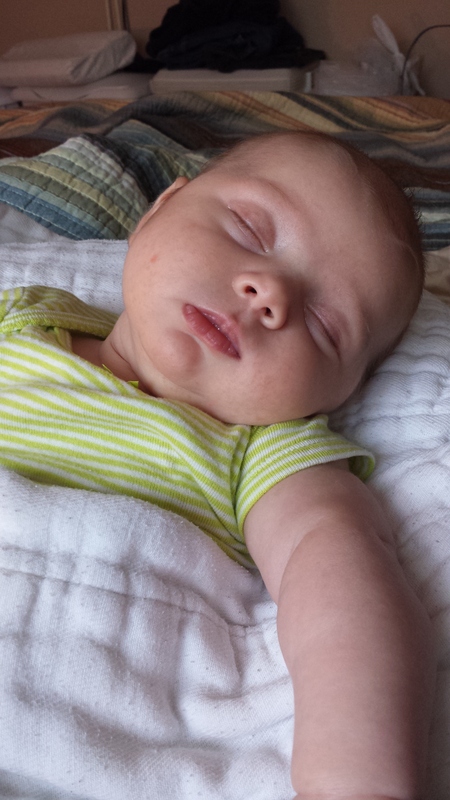 Those first 6 weeks…she was just a blob who nursed and pooped and nursed and slept and nursed some more. And that’s ALL SHE DID. But finally, she started smiling and cooing and looking like she SAW us, and then I started to feel like I knew her. The newborn stage is sweet in it’s own way, and sort of easy in it’s own way (for me), but it’s so much better when that blob becomes a BABY. It’s so sweet to see her face split into a wide grin when she sees her mobile, or when Bill makes funny faces at her, or when I bop her on the nose with my finger. 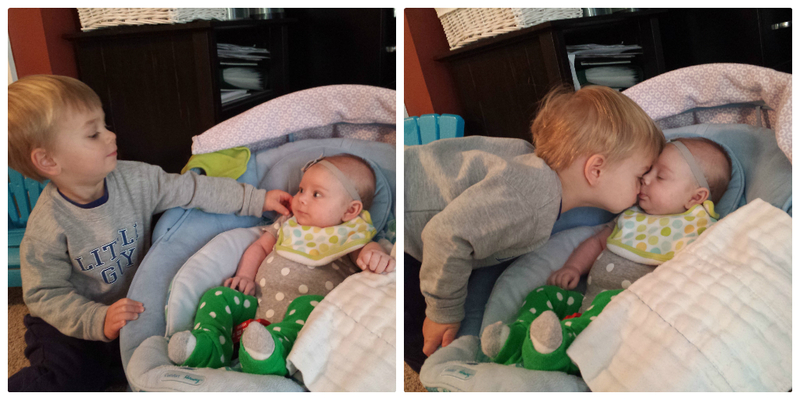 And it’s heart-melting to see her gaze up at Caelan, who already loves her. 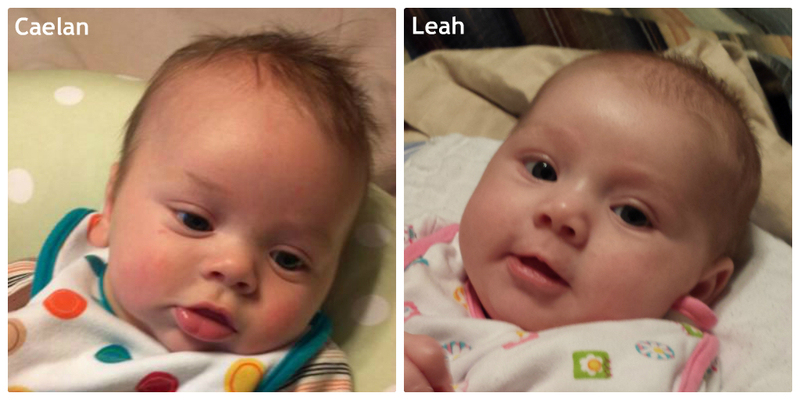 Adding Leah to our family has been…different…than it was when we added Caelan to our family. When Caelan was born, all the sudden we were PARENTS and we were very overwhelmed even though he was really a pretty easy baby. Our lifestyle changed dramatically, especially in the beginning. But when Leah arrived, we were already parents so the change was much less dramatic. Leah is, as I was telling Bill, “also there”. Our lives are pretty much the same as they were when it was just me, Bill, and Caelan, and now Leah is just…also there. Bill and I are missing the free time we used to have in the evenings after Caelan is asleep, but we’ll get it back eventually. Leah’s a pretty easy-going baby and has been a decent sleeper the past few weeks (though she’s had a few nights recently when she thought 3-4am was a good time to be up). But so far it’s been pretty easy to just bring her along for the ride. It’s true that my new diaper bag is practically a suitcase, but Bill and I are well practiced at taking Caelan out and about and throwing Leah on the pile (so to speak) hasn’t been a huge change (yet). The most difficult time we had with Caelan was the 3-6 month period when we were adjusting to me being back at work and when he had all of his major sleep issues. We’re headed into that time frame now with Leah. Obviously, Leah is a different child so who knows how it will be with her, but she’s woken up at night more frequently this past week so that’s not a good sign. Looks like she’s following in Caelan’s footsteps since his sleeping fell apart right about this age too. But she has shown signs of being able to fall back asleep on her own in the crib and that is a very good sign! Hopefully she’ll follow all the way through in Caelan’s footsteps and become a great sleeper in a few months. And actually, last night was her best night yet – sleeping through 9 hours! But if we have a rough time with Leah, at least we know now that everything with babies is just a phase and they are likely to grow out of it soon. This too shall pass, and all that. 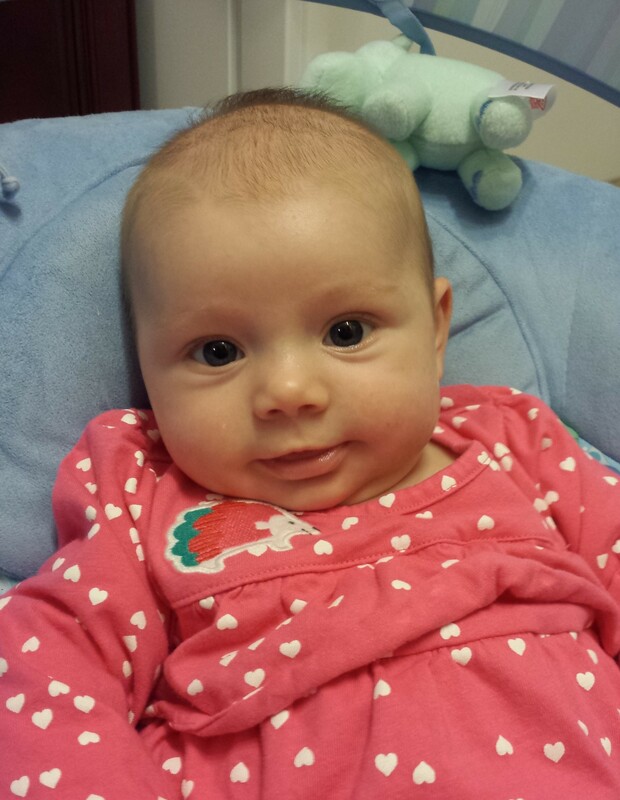 For now, we’ll leave the newborn stage behind us…Happy 3 Months, baby girl!! You are currently browsing the Decorate This blog archives for November, 2013.